Samsung just won't let anybody catch their breath when it comes to hardware releases. Just a few weeks after the worldwide release of the Galaxy S4, the company has posted public information for a new press event, explicitly declaring that new Galaxy and ATIV devices will be on display. Galaxy is of course Samsung's everything, everywhere brand for Android, and for those not in the know, ATIV is their newer generation of Windows products. 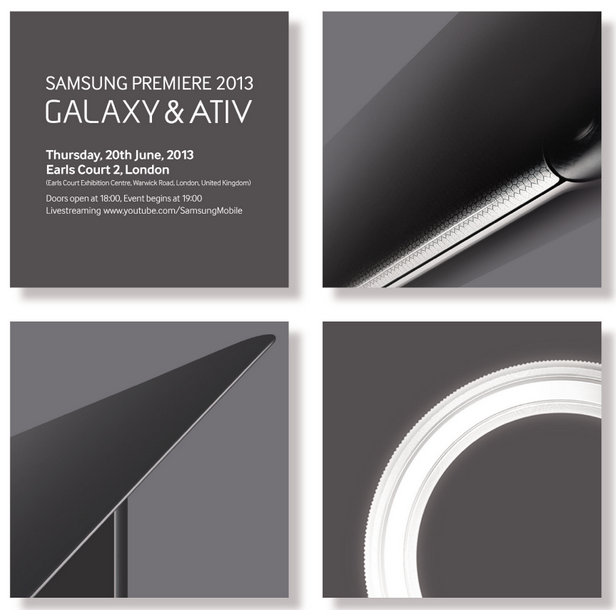 The Samsung Premiere event is set for Thursday, June 20th, at the Earl's Court Exhibition Centre in London. Gentlemen, start your speculation. There are any number of new Android products that might be revealed, but for my money, a new generation of the 10-inch Galaxy Tab is right at the top of the list (the underwhelming 7-inch version of the Galaxy Tab 3 has already been shown). There's also the possibility that it could be the Galaxy S4 Active, or the rumored Galaxy ZOOM, a sequel to the Galaxy Camera. The preview image looks a lot like a Windows laptop. If you're wondering, it's a bit early in the release cycle to expect the Galaxy Note 3. Of course, Samsung has so many buns in the oven that anything you read here is pure guesswork. We'll know for sure in about a month. The event starts at 5:00 PM Greenwich Mean Time, which is noon and 9 A.M. for us yankees. It looks like the press invitations haven't been issued yet.